You know you’re in East London when even the exercise classes are ironic! And so it is that new dance/fitness/holistic space, Frame has come to be. ” An 80’s dance/ aerobics class to the sounds of Madonna, Michael Jackson, Duran Duran…. Come and learn the routines from Thriller to Vogue and be in a dance off to Beat it…. ” Oh blimey. Rumour has it that they will also be teaching us the dance to Beyonce’s ‘All The Single Ladies. Hahahahahaha! If that sounds too retarded for ya, then the yoga for cyclists looks set to be a good one. My knees have been hurting me recently; no doubt all the snowboarding and skateboarding I used to do didn’t help much, so I reckon something like that might be a good idea. 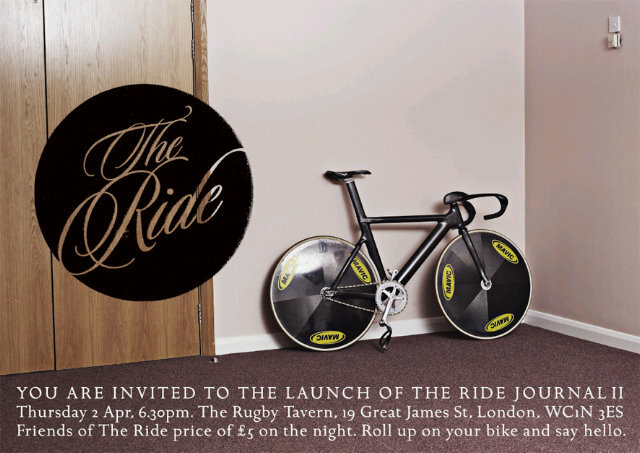 After that there’s the launch of the new issue of The Ride Journal, so get down to the Rugby Tavern and grab a copy for a fiver.